A combo of sweets and crackers would be the perfect gift for Diwali, the festival of lights. We present you a wide range of Diwali sweets with crackers to choose from. So, buy or send sweets and crackers this Diwali for your near and dear ones. So, the festival of Diwali is round the corner, what are your plans for the day. Diwali means sweets and crackers to everyone. Whether a child or an adult, everyone knows well the significance of these two prominent things on the festive occasion. On the great grand festive season, presenting these two things is also a trend. People do exchange sweets with those who live nearby but the long distance relations are nurtured only through verbal or virtual gifts. But, this is not going to happen this time. We are now providing all with the same opportunity to pass the festive wishes on the day with Diwali sweets and crackers. Yes, this is the right news that you heard. Not only the near ones but the dear ones who live far away from you would also get surprises on Diwali and that too in the form of Diwali sweets and crackers. This is going to be the best ever present for your loved ones and definitely the thing that would remain in their memories for longer time. At this most trusted destination, you have the option and choice to send the perfect combo of sweets and crackers to loved ones for Diwali special gifting. Undoubtedly, this is going to be the best ever present for you for the grand festive day of celebration, marking it to be the coolest present ever from your side. Without any complication or hassle, through this reliable and trusted destination you can now send Diwali crackers with the perfect combo of sweets to loved ones who are close to your heart but are residing far away from you. Delectable cakes with amazing crackers, this is going to be the best present from your side to loved ones, isn't it? If you want to pass the festive wishes of Diwali to your loved ones who are living far away from you and you are facing the dearth of options then definitely, after being here you would not. Definitely, you are going to get the best options and choices for your Diwali gifts, right here from us. There is no hassle and complication for people now to send the perfect combo of sweets with crackers on Diwali. Order your gift and it would be delivered to the desired destination within the day. Same day Diwali sweets and crackers delivery to your loved ones destination. 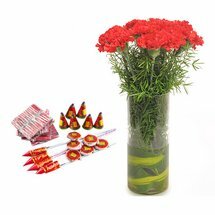 This Diwali gift express delivery is definitely going to be one amongst the greatest favor for those who really don't want to take any risk and want to cover the festivity with something much special and prominent. With no extra delivery or shipping charge, your gift would be delivered to loved one's place on the same day of placing the order.